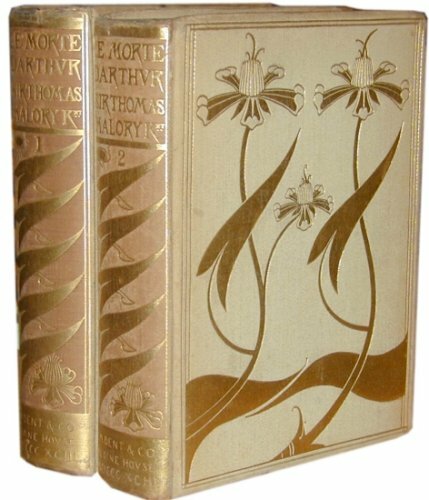 Designed and printed in the style of William Morris and his Kelmscott press, it recalls the mediaeval world, but seen through Beardsley’s Art Nouveau eyes. 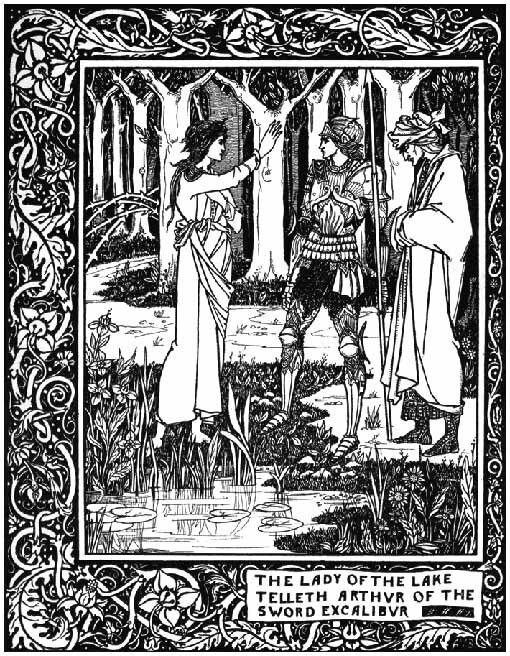 I had a chance to look through it once in a rare book shop, and while I liked the art, I didn’t find Beardsley’s depiction of Arthur or the other characters appealing. What of the original Caxton book? I finally found out why there are no scans of it. There are only two copies known to exist, and one is incomplete! That makes it perhaps one of the rarest printed books in English. There was a facsimile edition published in 1977, but I haven’t found any images from that. For about 500 years, the printed book by Caxton was the earliest known version of the work. It was popular, and reprinted frequently by others, as early as 1498. 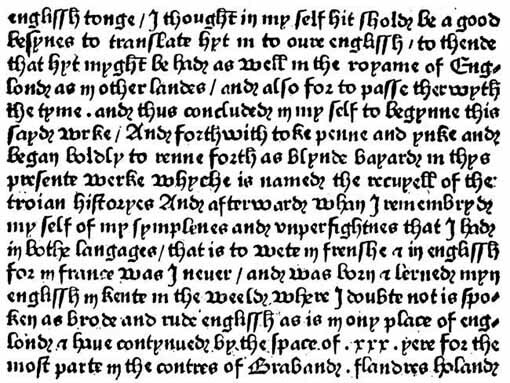 Caxton, in his introduction, tells of being given the Malory manuscript, which he essentially edited into final form. Malory was apparently dead by the time Caxton’s book went into production. 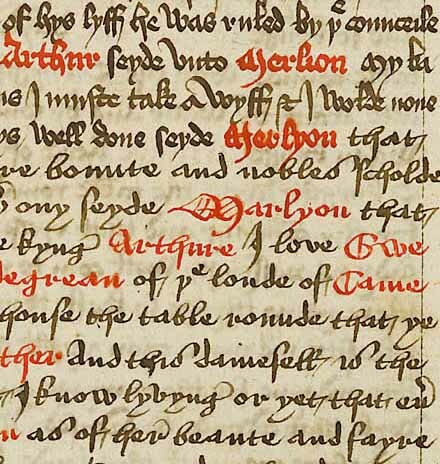 Then, in 1934 a manuscript was found in the Winchester College (England) library that is a copy of Malory’s work, lettered by two different scribes, using red ink for many of the names, sample page above. As you can see, it’s in a style not too different from the manuscript, a style known as Blackletter, and one where some of the alphabet is shaped considerably differently from what we use now, making the words hard to read.The fact that words were often spelled differently than they are now doesn’t help! 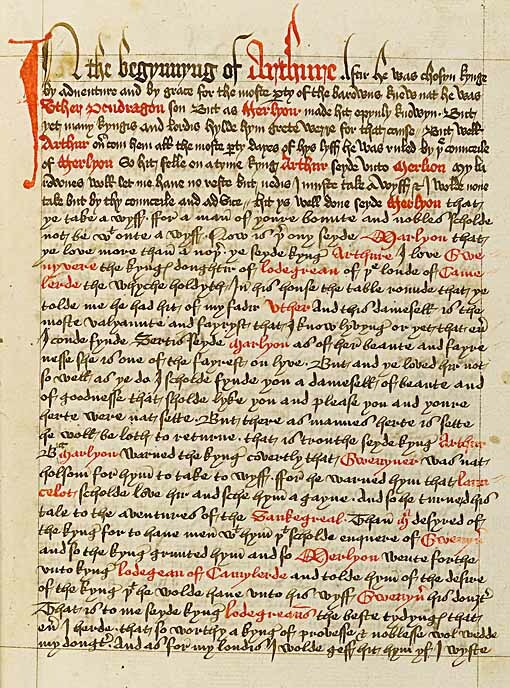 Caxton used the Winchester manuscript, but from studying the two, scholars believe he must have also had another source, perhaps Malory’s own manuscript, and Caxton used elements from both in his edited version of the final book. I know this is all pretty technical, but these are things I considered when deciding where to find the text for my print, and how to depict it. If copyright were not an issue, I think I would have taken my print text from T.H. White’s The Sword in the Stone, but I couldn’t do that legally. The obvious choice was to go back to White’s source, the Malory book. I printed out the first seven chapters of Le Morte d’Arthur from one of several online sources, and read through them. They covered the event I wanted to show in my print, the drawing of the sword from the stone, but I needed to condense the story further to get it onto a single image and still have room for J.H. Williams III to draw something! This forced me to become an editor/adapter myself, but really, that’s been the whole tradition with Arthurian legends. Malory himself was adapting and drawing from earlier works, like Geoffrey of Monmouth’s Historia Regum Britannae, then considered a true history of England, but later shown to be largely made up by Geoffrey. 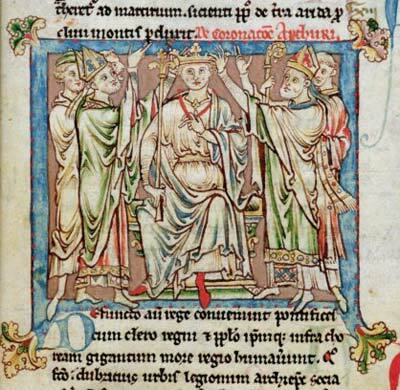 Geoffrey himself drew on earlier works like the Historia Brittonum, and that work was compiled from earlier ones. You can follow these threads back a long way, but never come to a satisfying conclusion about who wrote what, or what was history and what was legend. The entire tangle has roots in Welsh legends, early French romances, and lots of other sources now lost. The entire subject is called the Matter of Britain, and has provided many scholars with writing careers, but there seems to be no consensus. If there was a historical Arthur, all we can say is, we don’t know anything for sure about him. 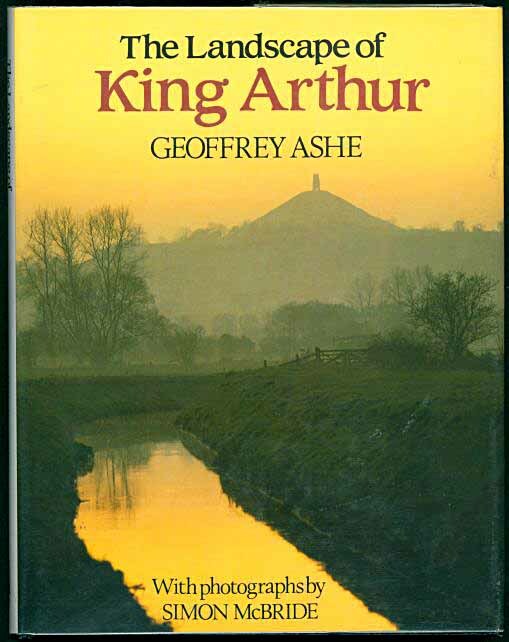 In several books like this one, author Geoffrey Ashe tries to tie the legends to a historical Arthur from 6th century England, a local warlord, perhaps descended from the Romans who had occupied England for a few hundred years, but again, his theories are fun but not conclusive. You can read more about the theories and controversies surrounding King Arthur in this Wikipedia entry. It befell in the days of Uther Pendragon, when he was king of all England, that there was a mighty duke in Cornwall that held against him, the Duke of Tintagil. King Uther sent for this duke, charging him to bring his wife Igraine with him, for she was called a fair lady and passing wise. When the duke and his wife were come unto Uther, he liked and loved this lady well, and desired her, but she was a passing good woman and would not assent unto the king. She told the duke her husband, “I suppose we were sent for that I should be dishonoured; wherefore I counsel you that we depart suddenly, that we may ride all night unto our own castle.” They departed, and when the duke had this warning, he furnished and garnished two strong castles. His wife Igraine he put in Tintagil, and himself he put in Terrabil. Then was the king wonderly wroth. In all haste came Uther with a great host, and laid a siege about the castle Terrabil, and there was a war made. For pure anger and great love of Igraine, the king Uther fell sick. “My lord,” said Sir Ulfius, “I shall seek Merlin, and he shall do you remedy.” And Merlin was bound to come to the king. “Sir,” said Merlin, “I know all your heart, so if ye will be sworn to fulfil my desire, ye shall have your desire.” Then the king was sworn. “Sir, this is my desire: the first night that ye shall lie by Igraine ye shall get a child on her, and when it is born, it shall be delivered to me to nourish as I would have it.” “I will well,” said the king. Said Merlin, “This night ye shall lie with Igraine in Tintagil, and ye shall be like the duke her husband.” This was done as they devised. King Uther lay with Igraine and begat on her that night Arthur, and on the day he kissed the lady Igraine and departed in all haste. But, in the night, the duke issued out of the castle Terrabil at a postern, and himself was slain or ever the king came to Tintagil. When the lady heard tell of her husband, then she marvelled who it might be that lay with her in likeness of her lord. She mourned privately and held her peace. The barons by one assent prayed the king accord betwixt the lady Igraine and himself. The king put all trust in Ulfius to entreat between them, so at the last the king and Igraine met together. “Now will we do well,” said Ulfius. “Our king is wifeless, and my lady Igraine is passing fair, and it might please the king to make her his queen.” And anon they were married. Then Queen Igraine waxed daily greater and greater. As King Uther lay by his queen, he asked her whose was the child within her body. She was sore abashed to give answer. “But tell me the truth, and I shall love you the better,” said the king. Said she, “Sir, the same night my lord was dead there came into my castle of Tintagel a man like my lord in speech and in countenance, and so I went unto bed with him as I ought to do with my lord, and the same night this child was begotten upon me.” Said the king, “Dismay you not, for it was I myself that came in the likeness. I am the father of the child.” And he told her how it was by Merlin’s counsel. Then the queen made great joy when she knew. When the lady was delivered, the king commanded the child unto Merlin, and so he bare it forth unto Sir Ector, a lord of fair livelihood, and named him Arthur, and Sir Ector’s wife nourished him. It’s one of the places in Malory, other than London, that are easy to identify today. 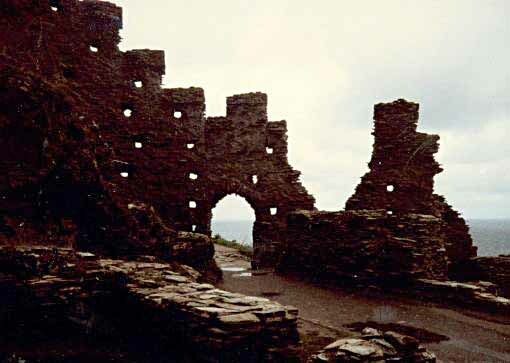 This castle was only built in 1233 though, by Richard, the Earl of Cornwall, who wanted to be identified with the already existing Arthurian legends, and was added to the book by Malory probably as a nod to his friend the then Earl of Cornwall. It’s a great, atmospheric place to visit nonetheless. Some other things to notice in the text above. Arthur’s father is named Uther Pendragon. A dragon, again. You can read in the previous link about the name, of Welsh origin, with Pendragon originally meaning “foremost chief.” Geoffrey of Monmouth misinterpreted it to mean a dragon’s head, and connected it to a comet seen by Uther, and a prophecy of Merlin. Both that story, and the one about the two battling dragons were in the Merchant book, King Arthur and his Knights, that I discussed last time. But the dragon theme seems to keep popping up in Arthurian and British legends, from the Red Dragon of Wales to Saint George and the Dragon. Though Uther’s origin is Welsh, he’s battling a Duke of Cornwall. Both Wales and Cornwall are strongly Celtic. Merlin’s origin is also from Welsh bardic myths and traditions. Again, Geoffrey of Monmouth took him over and associated him with the devil (as a possible father) and magic of perhaps the black sort. Malory leaves much of that out of his book, presenting Merlin as a more admirable, if not always moral, figure, who on the one hand helps Uther bed a woman married to another man through trickery, on the other hand arranges for young Arthur to be raised by Sir Ector in relative safety, away from the continuing battles of his father Uther. In Malory, one sees a mix of the Briton/Saxon heritage in Uther, while Merlin and the Duke of Cornwall seem to represent the Celtic tradition. No doubt those factions were often at odds in mediaeval England, especially after the Roman occupiers left, creating a power vacuum. T.H. White played heavily on that theme in his books about Arthur. Arthur’s mother, Igraine, plays only a small role in Malory’s book, and seems a rather heartless person, not too concerned about her husband’s death, or the fate of her child. Perhaps someone needs to write the story from her perspective someday. One last question about the sword in the stone: is it Excalibur? As usual, scholarly opinions differ. Malory describes another origin for Excalibur, drawing from earlier works, but confusingly, also calls the sword in the stone Excalibur at some point. Most accounts seem to keep them as different swords, which I think makes more sense, and allows Arthur to be given his sword Excalibur by the Lady of the Lake some time later in his reign. So, what happened to the first sword? It fades from view without comment. Perhaps there are the makings of another book there. With the stage set, I’ll be talking about the Malory text I DID use, and the creation of the print art next time. This entry was posted in Items for Sale on June 10, 2009 by Todd. Marion Zimmer Bradley’s “Mists of Avalon” tells this story from the perspectives of Igraine, Morgana and Guinevere. Was your comment about “someone should write a book” meant as a nod to Mists? And if so, did you have a book in mind that talked about the sword in the stone between the time it was drawn from the stone and the time it was given again to Arthur by the Lady of the Lake? Hi Tipa, I haven’t read “Mists of Avalon,” or I would have known that was the book I was looking for! I’ve seen it many times, just never picked it up. This is fascinating stuff! I was exposed to the legend by Stephen Lawhead’s Pendragon books when I was 12 or 13. They’re good, but I like T.H. White’s stories better. Never made my way around to Malory. Looking forward to the print!